Any floor that has been sealed with any varnish or lacquer will benefit from Bona Polish which is easy to apply. Within 1-2 hours your floor will have an enhanced look and due to the polyurethane content it will have a longer life and will offer better resistance to knocks and damages as well as spillages etc. A floor can be made glossier by applying 2 coats of the gloss polish. The drying time is approximately an hour at room temperature and tools can be cleaned in water. Once cleaned, simply use a micro-fibre roller or pad and apply the Bona Polish in any direction, ensuring that you go in the direction of the wood grain to finish off with. Two applications are recommended for best results. 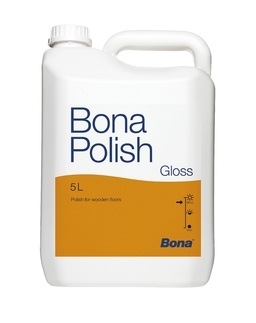 Whilst the Bona Polish is being applied it is a good idea to keep the applicator flat to the surface and to work from one side to the other without lifting the pad to reduce air bubbles which in turn can create an uneven sheen.